A chimney fire warped this chimney cap. A chimney flue is very important because it carries dangerous byproducts of combustion out of your home. Fires have been used for warmth for centuries, and over time our knowledge of what needs to be done in order to keep the chimney safe has evolved. A dirty or damaged chimney can be potentially destructive in that it can cause a chimney fire which can significantly damage your home and hurt or kill those who live inside of it. 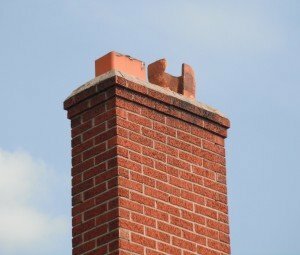 What is a chimney fire? A chimney fire occurs when a fire actually moves up into the flue system so that it is not burning only in the specially designed firebox, it is burning in the chimney itself. A chimney is designed to hold the hot gases that are byproducts of burning a fire. It is not designed to hold a fire. Some characteristics of a chimney fire include a lot of dense smoke and intense heat and a noise that sounds like a freight train rumbling by. Not only does a chimney fire cause damage to your chimney which almost always results in the chimney having to be relined or rebuilt, it can damage nearby combustibles which include walls to your home, the roof, etc. The worst part about the incredible damage that a chimney fire can cause is the fact that it was completely preventable in the first place. A properly working and designed chimney is capable of ventilating the extremely hot gases that are the byproducts of combustion. However, when the flue system is missing mortar joints or has cracks, a chimney fire is able to happen because the fire is able to catch the wood framing of the home. Creosote buildup is another condition conducive to a chimney fire occurring. Any amount of creosote is capable of being caught on fire, but an excessive buildup is particularly bothersome to chimney professionals because this provides a chimney fire with plenty of fuel to burn for a long time, causing destruction. In prefabricated, metal chimneys, it is important to use only Underwriter’s Laboratories (UL) listed parts for replacement. Most UL listed parts and systems have been tested by this organization to withstand very high temperatures (above 2000 degrees) but under chimney fire conditions can still be damaged. When a prefab unit has been damaged by a chimney fire it must usually be replaced completely. Cracked flue tiles, warping of metal parts associated with your wood burning system, warped or discolored chimney caps, and very puffy creosote which may be multicolored are all indicators that a chimney fire has occurred. A chimney that is cleaned regularly and inspected with video equipment is the safest chimney to burn a fire in. 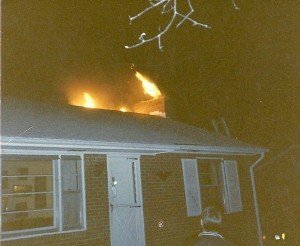 If a chimney fire should occur you must get out of the home immediately and call the fire department. If you are able to without putting yourself or anyone else in danger, before the fire department arrives it is helpful to spray down the roof of the home to prevent the fire from spreading to the roof. I’m not doubting your skill levels, but this does not sound like a do it yourself project. Since I cannot see your particular situation. I want to be cautious about what I am saying here! Obviously, someone told you that you have crystallization which I will “ASSUME” is 2nd-degree creosote, so I must think that there may be a serious situation. I’m attaching three of our “Ask the Chimney Sweep” videos, that may just help in selecting which path that you may be pursuing, in resolving this issue.